观点洞察 - How much further can renminbi depreciate? How much further can renminbi depreciate? Every investor is worried about a new round of depreciation of renminbi (Yes, again!). Seems this topic is always an easy sell among news headlines. Renminbi began to weaken, dropping from an exchange rate (USD/CNY) of 6.24 in late March to 6.82 as of July 24, since the breakout of a trade conflict between the US and China. The latest proposal from China central bank to incentivize banks to expand lending to companies created another worry among investors on monetary easing. The million-dollar question will be how far the depreciation can go. Let’s examine this matter from a few different perspectives and get a better understanding of the current situation. 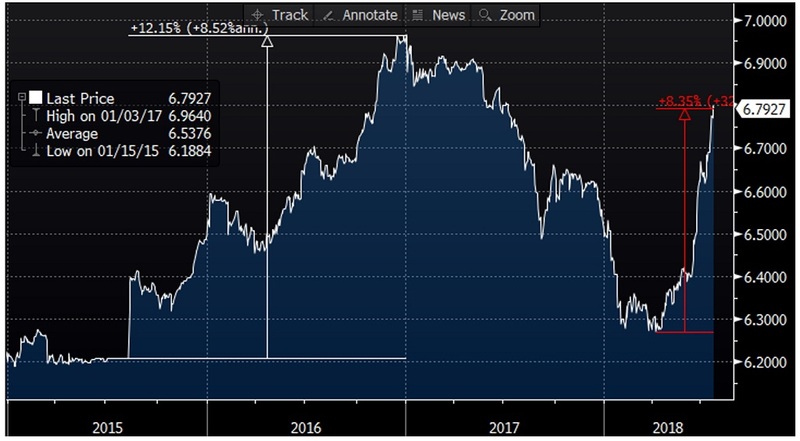 If history does repeat itself and provides an indication for any future movement, then maybe we can take reference to the past downward movement of renminbi during the period of 2015 and 2016. For readers who have good memory about the incident 3 years ago, the depreciating pressure of renminbi was enormous back then. 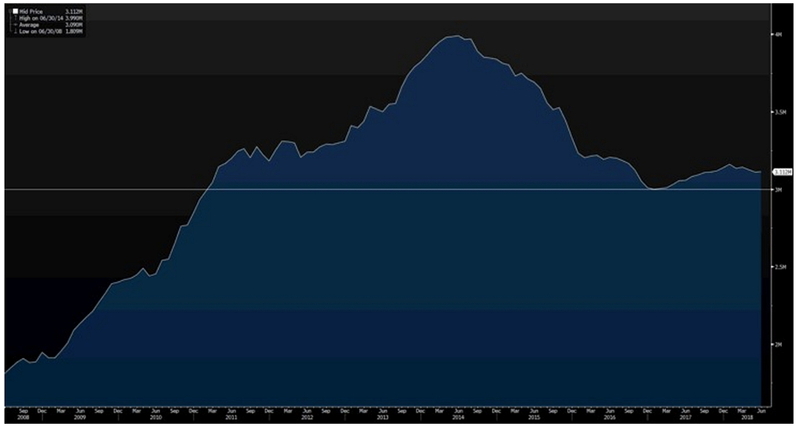 Just to name a few: (i) a massive sell-off in A-share market with the benchmark index down about 45%, (ii) China’s GDP decelerated and grew at sub-7% in 3Q15, (iii) Caixin PMI dropped below 50 and remained there for 12 consecutive months, (iv) 10-year yield went from 3.70% to 2.66%, and (v) China’s Credit Default Swap (CDS) almost doubled from 78.5 bps to 150.5 bps. If the concern this round is similar to what we faced in 2015, then it seems we have already witnessed the major portion of the depreciation in terms of the magnitude. Interestingly, if renminbi does depreciate with the same magnitude as in 2015/16, then the exchange rate would be 7.00, which happens to be the consensus level for a psychological threshold. That said, the timeframe to digest the concern may not be enough this time as it took less than 4 months for the depreciation so far versus 16 months during the time between August 2015 and December 2016. To a certain extent, the rebound of the US dollar led to a common depreciating pressure in almost all major currencies worldwide. Comparing the movement of renminbi with currencies in developed markets, the drop seems to be relatively large. 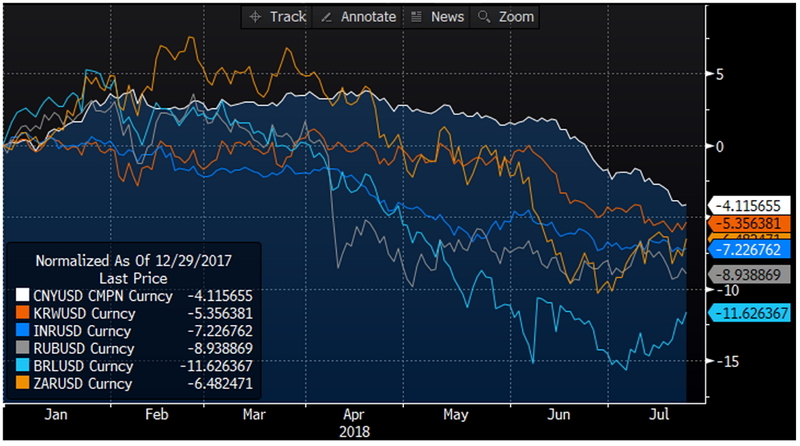 However, relative to other emerging market currencies the depreciation is quite mild year-to-date. No one mentions BRIC anymore in recent years, but China continues to stand out from Russia, India and Brazil based on the currency’s stability. Reminbi fell 4.7% year-to-date versus Russian Ruble’s -9.1%, Indian Rupee’s -7.9%, and Brazilian Real’s -14.3%. Even with only a 4.1% depreciation year-to-date, some economists believe that this magnitude is hardly justified given the limited potential impact of the trade conflict with the US. One estimate is that the new US tariffs, imposed and announced, applying to the Chinese exports of USD 258 billion, would raise the average tariff on Mainland Chinese goods shipped to the US by 7.7% only, or simply 1.4% additional tariff on all China’s exports globally. 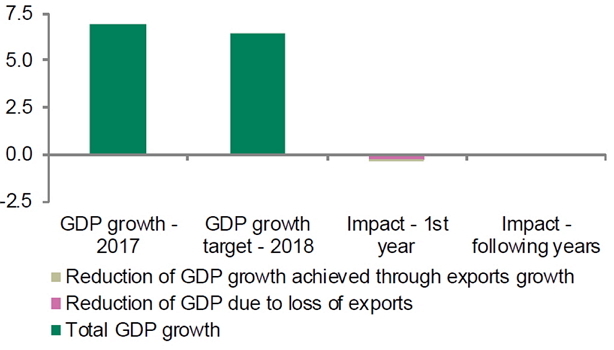 Translating it into reduction of GDP, the negative impact is merely a 0.3 percentage points to 2018’s figure, and even a smaller fall of 0.1 percentage point thereafter. Another positive argument is that China remains fully control of its exchange rate system on the back of its strong foreign reserves position, which is about USD 3,112 billion in June 2018, rebounding from the recent low of USD 2,998 billion in early 2017. China has long been the world’s currency hoarding champion for more than a decade. Its currency reserve position is about 28.7% of its GDP, a level that would be sufficient to meet any contingency. For comparison, South Korea’s reserves were just 3.7% of GDP when Asian financial crisis hit its economy badly in 1997. Besides, the surpluses in both current account and balance of payments bode well for China’s external balance sheet. Given the recent slowdown of economic growth momentum and the ongoing deleveraging, there is concern about rising defaults among Chinese corporates in both onshore and offshore markets. If defaults get out of control and hurt real economic activities, then it may drive down investors’ confidence in the Chinese currency. Market participants seem to be waiting on the side lines for signals regarding Beijing government’s willingness to step in and contain the renminbi’s fall. We believe that policymakers still have a few tools to support liquidity in the system. 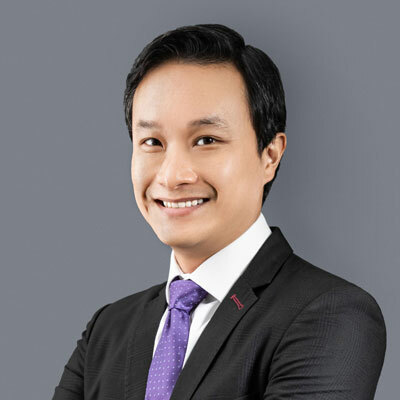 For example, the central bank may reduce the required reserve ratio by a few percentage points further over the next 12 months to allow banks absorb wealth management products and non-performing loan provisions. The continued push of debt-to-equity swaps may also help achieve the target of deleveraging whilst preventing a downward spiral toward a liquidity crunch. Hypothetically, if there are no more irrational and irresponsible messages posted on Trump’s Twitter account, then we may have already seen the bottom of renminbi.